Wortwell, straggling along the old Diss to Yarmouth road, is in the parish of Redenhall, a reminder that there is a difference between a village and a parish. The main street is now bypassed, and quieter than it has ever been; but there is a quiter part of the village still, and you might not even know about it unless you looked at an OS map. This is the lower street, where the oldest part of the village is. It winds down from the main road and narrows through a scattering of cottages before opening out into the flood plain of the Waveney and eventually taking you over the bridge into Suffolk. There is no Parish Church in Wortwell, but there is a busy congregational chapel up on the main street. 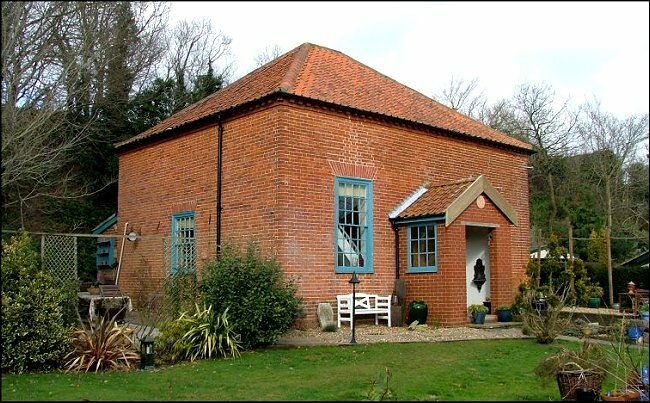 However, down here in the lower village is this beautiful red brick building, built as a Baptist chapel in 1822. Non-conformism is strong in south Norfolk, and so are opinions. It is easy to imagine the 19th century theological debates between villagers of the two denominations. East Anglia has a surprising number of remote, rural Baptist chapels that are still in use for their original purpose. But this is not one of them. Probably, the proximity of the Congregational chapel, and the larger Baptist churches of Diss and Bungay, meant that the congregation here declined. By the 1980s it had fallen into disuse. It might easily have been demolished in that unenlightened age, but fortunately for us the Catholic church at Bungay, in which parish this is, took the building on as a chapel of ease, dedicated to St Mary. Well into the 1990s it hosted a vigil Mass every Saturday evening. But it is a remote part of the village, and the road to it is not a good one. Eventually, the Catholic Parish was able to take on more suitable accomodation in the town of Harleston, a former school which is now the church of St Thomas More. Today, this chapel is St Mary's cottage, a private house, but an intriguing reminder of the history of the Baptists and the Catholics, today perhaps East Anglia's two most vibrant denominations.